Laura Carmichael, AKA "Lady Edith" from one of my favorite shows, Downton Abbey, is constantly killing it on the red carpet. Her makeup is always flawless, and I was totally feeling her gray-black smoky eye at the Golden Globes from a couple of weekends ago. 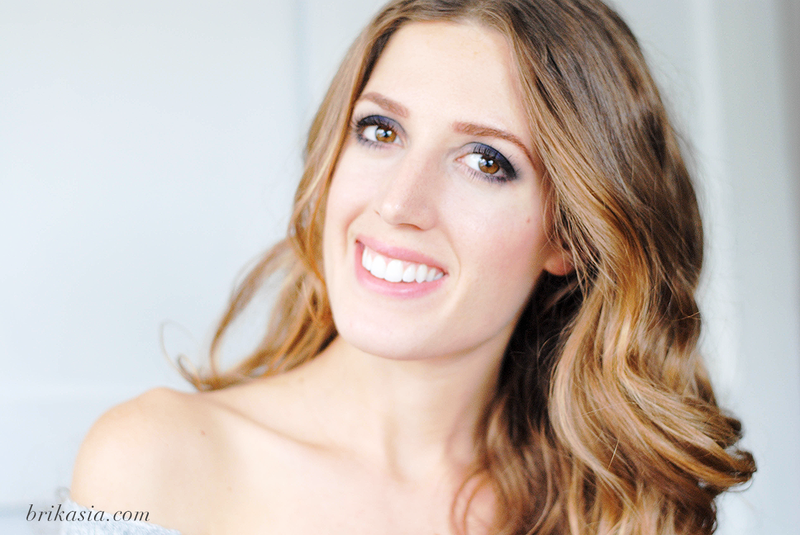 I was able to get my gorgeous friend Beulah (check out her blog!) to be my model for this look, so I decided to change it up and give Beulah a navy blue smoky eye. You can adapt this tutorial to whatever color you want! I knew navy blue would look great on Beulah, so I just ran with it. 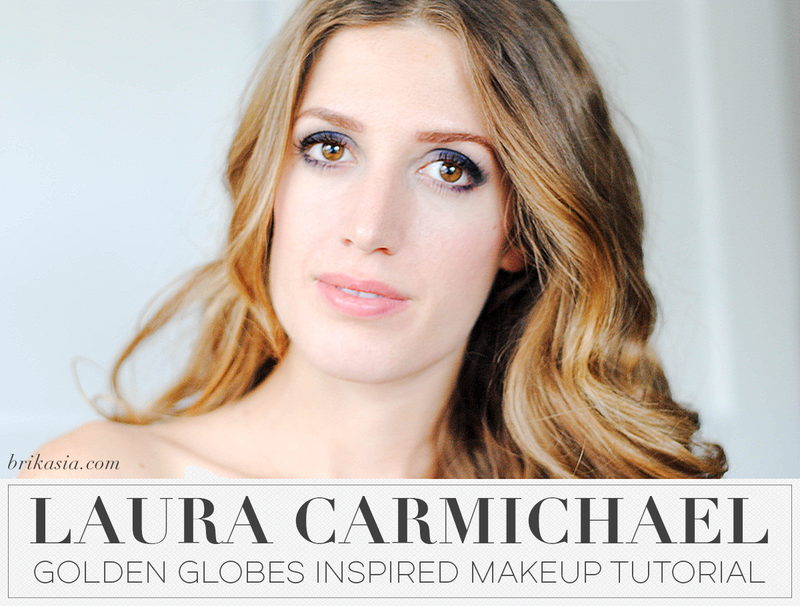 Read on for the full tutorial! Start off by applying a navy blue eyeshadow base. I am using this one by NARS. 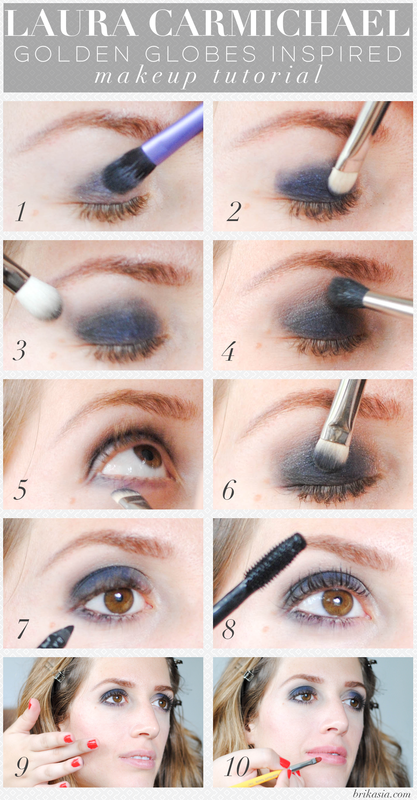 Apply a matte, navy blue eyeshadow on top of your eyeshadow base. Blend the edges of your blue eyeshadow well into the crease. We don't want any harsh edged! I'm using a stiff, fluffy brush to blend. Using a tapered blending brush, apply a mid-tone matte brown eyeshadow into the crease to help blend the eyeshadow out. Take your matte navy blue eyeshadow and bring it underneath your lower lashline. Take a matte, black eyeshadow and blend it close to your upper lashline to add to the smoky eye effect. Apply a black pencil eyeliner onto your waterline. If your eyes are sensitive, then you can skip this step. Apply mascara. Since Beulah has craaaazy gorgeous lashes, I didn't add any falsies. Feel free to add some individual false lashes at this part if you're feeling bold! Apply a cream blush. I wanted this look to have a nice glow to it, hence why I am using a cream blush. Apply a neutral pink-peach lipstick. This look is so easy to do, and adds the perfect amount of smoulder to a night out on the town. And for my brown-eyed beauties, navy blue really makes your eyes pop! Special thanks to Beulah for being my model for this look. Be prepared to see a lot more of her here on Brikasia! What's your favorite look to wear for a night out on the town? What a gorgeous look! I love the combination of navy blue and the peachy lipstick on Beulah. This is such a smokin' hot look! You are killing it! Such a gorgeous look. You're so beautiful! Gorgeous look on you! I wish I had seen Lady Edith on the Golden Globes. On DA, she often wears beautiful colors that I adore. Gorgeous! I don't think of using navy much, but you've inspired me to. gorgeous. I really need to use Navy more. This is such a gorgeous look!!! Beulah is beautiful too! !